Hawaiian Theme Children Girls Room Décor. Cruiser Art girl's children's room theme Hawaii Hawaiian décor. Decorate in vintage surfing nostalgia theme. We offer two attractive frame choices - Hawaiian Koa veneer (above) and Tropical Bamboo (left). Frames are available in two sizes. 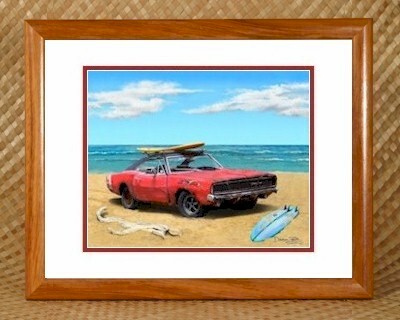 The smaller frame features an 11x14 inch matted version of our Dodge Charger open edition laser art print. 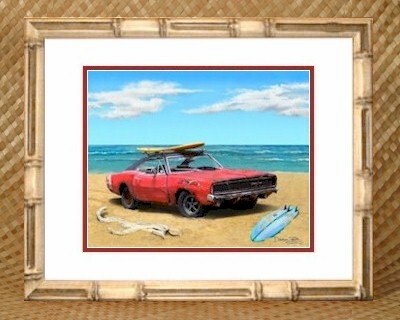 The larger frame features a 16x20 inch matted version of the Dodge Charger, which has the added attraction of being printed on Linen Weave textured paper (details below). The outer mat is white while the inner mat forms a brown border accenting the print's vibrant colors. You may select a custom inner mat color at no additional cost. The link to the left shows the color options. Since the advent of the automobile age a century ago, the beach cruiser has become a nostalgic presence found along ocean shorelines worldwide. Usually old, and always rusted, the beach cruiser is an integral part of the beach and surfing culture. To those who cast only a cursory glance, the cruiser is often seen as no more than an unwelcome eyesore. But to those who look beyond its rusty and faded skin, the cruiser is truly the embodiment of a unique lifestyle marked by sun, sand, salt and surf. Leisurely passing time with fellow cruisers while their owner searches out that perfect wave is truly Paradise – the Paradise of a beach cruiser.